Negotiable Instruments Act, 1881 - Sections 138 and 141 - Offences by companies - Specific proof of resignation of Director - defence taken that they were not directors at the time of offence, is a fact which they have to prove before court below - self written letter sent to boards of directors of firm without any Form 32 of Company Act - these simple letters are not admissible. Every person who at the time the offence was committed, was in charge of, and was responsible to the company for the conduct of the business of the company, as well as the company, shall be deemed to be guilty of the offence and shall be liable to be proceeded against and punished accordingly; further if any such person proves that offence was committed without his knowledge, then he shall be punished, so this is a rebuttable fact and burden lies upon the person, who states that the offence was committed without his knowledge. Its proviso also provides that where any offence under this Act has been committed by a company and it is proved that the offence has been committed with the consent or connivance of, or is attributable to, any neglect on the part of, any director, manager, secretary or other officer of the company, such director, manager, secretary or other officer shall also be deemed to be guilty of that offence and shall be liable to be proceeded against and punished accordingly. 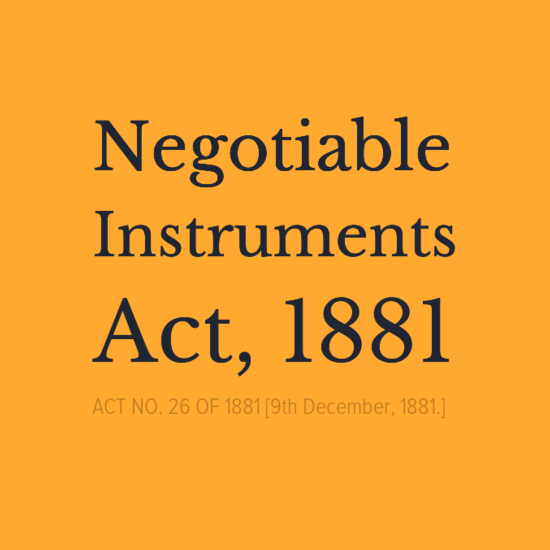 Negotiable Instruments Act, 1881 - Section 139 - Presumption in favour of holder - admitted signatures on cheques in question, so facts relied that there was no liability and cheques were issued during purchase order; that cheques were given as security and have been misused, are rebuttable facts to the facts narrated in complaint, which petitioners required to prove before court below. 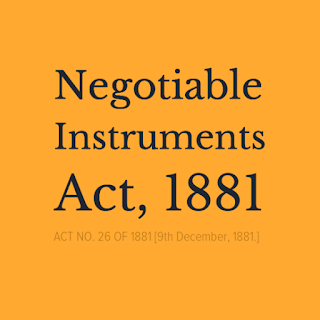 Negotiable Instruments Act, 1881 - Sections 138 - Quashing of Complaint - all the documents relied by petitioners were never before the trial court at the time of taking cognizance. So these cannot be relied in these petitions for quashing/setting aside the cognizance, unless these are public documents. 1. Since common questions of law and facts have arisen for consideration in these criminal revision petitions, these were heard analogously and are being decided by this common order. 2. In this criminal revision, the petitioners inter alia have assailed the validity of order dated 04.07.2017 passed by the Munsiff, JMIC, Samba in complaint, titled, Osaka Alloys and Steels Pvt. Ltd. Vs. Grand Batteries and others, whereby cognizance of the complaint was taken and process against the petitioners was issued as well as the subsequent orders passed by the Munsiff, JMIC, Samba. The petitioners also seek quashing of complaint under section 138 of Negotiable Instruments Act. 3. In this criminal revision, the petitioners inter alia have assailed the validity of order dated 31.08.2016 passed by the Chief Judicial Magistrate, Samba in complaint, titled, Osaka Alloys and Steels Pvt. Ltd. Vs. Grand Batteries and others, whereby cognizance of the complaint was taken and process against the petitioners was issued as well as the subsequent orders passed by the Chief Judicial Magistrate, Samba. The petitioners also seek quashing of complaint under Section 138 of Negotiable Instruments Act. 4. In this criminal revision, the petitioners inter alia have assailed the validity of order dated 31.08.2016 passed by the Chief Judicial Magistrate, Samba in complaint, titled, Osaka Alloys and Steels Pvt. Ltd. Vs. Grand Batteries and others, whereby cognizance of the complaint was taken and process against the petitioners was issued as well as the subsequent orders passed by the Chief Judicial Magistrate, Samba. The petitioners also seek quashing of complaint under section 138 of Negotiable Instruments Act. 5. For facility of reference, the facts in brief are taken from CRR No.77/2016. The petitioner No. 1 is a Private Limited Company duly incorporated under the Companies Act, 1956 and registered with the Registrar of Companies Rajasthan. The petitioner No. 2 is one of the Directors of the petitioner No. 1-Company, whereas the petitioner Nos. 3 & 4 were also the directors of the company but have resigned and are no more associated or dealing with the affairs of the petitioner No. 1-Company. The petitioner No.1-Company is manufacturer of Batteries having its industrial unit in the State of Rajasthan. The petitioner No.1-Company in connection with manufacturing of Batteries was requiring Lead and Lead Alloys, and accordingly came in contact with the respondent, who is engaged in the business of manufacturing of Lead Alloys having one of its industrial unit in the State of Jammu and Kashmir at Industrial Growth Centre, Samba. It is contended that after due negotiations with respect to purchase of aforesaid products from the respondent, the petitioner No.1-Company placed a standing purchase order dated 15.10.2014 with the respondent for supply of Lead and Lead Alloy on the terms and conditions as were stipulated in the said Standing Purchase Order. The Purchase Order issued by the petitioner No. 1-Company was for a period of one year only. It was further envisaged in the Standing Purchase Order dated 15.10.2014 that rate of each consignment will be discussed and then proforma invoice will be raised by the respondent at the agreed rate of payment. 6. The significant condition of the Standing Purchase Order dated 15.10.2014 after due negotiation with the respondent was that the petitioner No.1 will provide to the respondent security cheques so that the respondent could start and complete the production and at the time of dispatch, payment was required to be made through RTGS/LC. It is also indicated in the said Standing Purchase Order that use of security cheques will be invalid and illegal. It is further contended that the petitioner No.1-Company has provided as many as 27 cheques of different amounts from time to time as security notwithstanding the fact that it has made all the payments from time to time commensurate to the supplies made by the respondent. That the respondent with dishonest intention and in order to blackmail the petitioner-Company started executing threats to the petitioner Nos.2 to 4 that respondent will present security cheques given by the petitioner No.1-Company and on getting the same dishonoured, the petitioners will be roped into criminal liabilities. It is further contended that the respondent in utter breach and contravention of the Standing Purchase Order dated 15.10.2014, presented three such security cheques bearing Nos. 077884 dated 28.04.2016; 077885 dated 09.04.2016; and 077887 dated 09.05.2016 all amounting to Rs. 2,50,000/- and drawn on Punjab National Bank, Beawar Ajmer. On presentation of the cheques, the same were dishonoured and the respondent after issuance of notice, service of which was never effected upon any of the petitioners, has filed the complaint under section 138 of the Negotiable Instrument Act. The Court of Munsiff, JMIC, Samba on presentation of the complaint, took cognizance and issued process against the petitioner vide order dated 04.07.2016. It is contended that the summons issued by the trial court were never served upon the petitioners and on finding petitioners absent, the Court of Munsiff, JMIC, Samba issued non-bailable warrants against petitioner No.2 through SSP Ajmer Beawar, Rajasthan and petitioner Nos. 3 & 4 were directed to be informed through registered envelop, through some reputed courier service. Thereafter, on 08.11.2016, the petitioner No. 2 was produced before the Court of Munsiff JMIC, Samba in execution of the warrants issued and on his application filed, the court passed order on the same day directing petitioner No.2 to furnish personal bond and local surety to the tune of Rs.50,000/- with the direction to be remained present on the next date of hearing i.e. on 08.12.2016. It is lastly contended that the respondent has filed the complaint purely with the intention of blackmailing, harassing and victimizing the petitioners just to extract as much money as it could and the judicial proceedings are being abused by the respondent. In the aforesaid factual background, the petitioners have approached this Court seeking reliefs as stated supra. (a) That the impugned complaint under section 138 of Negotiable Instruments Act, titled, Osaka Alloys and Steel Pvt. Lld. Vs. Grand Batteries and others filed by the respondent against the petitioners is highly motivated, aimed at harassing and blackmailing the petitioners and is a clear abuse of process of law. (b) That the respondent has misused the security cheques issued by the petitioner No. 1-company, which as per the terms and conditions of the Standing Purchase Order and Minutes of Meeting dated 16.06.2016 were already held to be invalid. Once the respondent is signatory to an agreement that the security cheques are invalid and cannot be presented, it is ex-facie illegal and unlawful on the part of the respondent to present the cheques, which were dishonored and without valid service of notice of demand upon the petitioners, impugned complaint was filed, and that the manner in which the learned Magistrate entertained the complaint and initiated proceedings against the petitioners is highly contrary to the provisions of law. (c) That the learned Magistrate has failed to appreciate the provisions of Section 138 of the Negotiable Instruments Act in reference to the allegation alleged in the complaint and could not have taken cognizance of the complaint and issued the process. (d) That the cheques dishonored in the instant case is not a disputed question of fact, therefore, maintainability of the impugned complaint is highly disputed. The trial court while taking cognizance of the complaint and issuing process against the petitioners has not recorded any satisfaction with regard to commission of offence under the provisions of Section 138 of the NI Act. 8. On the other hand, the respondent has filed objections, wherein it is stated that the petitioner-company and respondent-company had business dealing with each other. The petitioner-company had been purchasing lead Ingots on credit from the respondent company and on account of such transaction there was a liability in the sum of Rs. 49,44,023/- against the petitioner-company and to discharge the liability in part, the petitioner company had issued the cheques in question. Evidencing the transaction having been taken place from time to time between the petitioner-company and the respondent-company as also as to the above stated outstanding against the petitioner-company, along with the complaint, the respondent-company has also annexed copies of the invoices/bills and the statement of account. It is further stated that the petitioner-company has proceeded to file the instant misconceived petition mindful of the fact that the case sought to be projected by the petitioners, the matter in hand would involve a question of fact, capable of being determined only by the trial court after recording evidence of the parties. It is also stated that to impeach cognizance having been validly taken by the trial Court in the complaint, the petitioners have acted totally unmindful of the mandate as envisaged under section 139 of Negotiable Instruments Act, which provides for presumption in favour of the holder. 9. Learned senior counsel for the petitioners has reiterated the grounds taken in the revision petition, whereas counsel for the respondent has argued that the documents which have been attached with this criminal revision petition are pertaining to a disputed question of facts, which cannot be adjudicated upon by this Court in a petition under Section 561-A Cr.P.C. It is argued that this Court while exercising power under section 561-A code of Criminal Procedure does not function as a court of trial, appeal or revision, therefore, this disputed question of facts can well be adjudicated by the trial court, who has power to do so. 10. I have considered the submissions made by the learned counsel for the parties and perused the record. ―10. To fasten vicarious liability under Section 141 of the Act on a person, the law is well settled by this Court in a catena of cases that the complainant should specifically show as to how and in what manner the accused was responsible. Simply because a person is a Director of defaulter Company, does not make him liable under the Act. Time and again, it has been asserted by this Court that only the person who was at the helm of affairs of the Company and in charge of and responsible for the conduct of the business at the time of commission of an offence will be liable for criminal action [See: Pooja Ravinder Devidasani v. State of Maharashtra & ors. AIR 2015 SC 675]. 11. In other words, the law laid down by this Court is that for making a Director of a Company liable for the offences committed by the Company under Section 141 of the Act, there must be specific averments against the Director showing as to how and in what manner the Director was responsible for the conduct of the business of the Company. 13. Perusal of this section would reveal that every person who at the time the offence was committed, was in charge of, and was responsible to the company for the conduct of the business of the company, as well as the company, shall be deemed to be guilty of the offence and shall be liable to be proceeded against and punished accordingly; further if any such person proves that offence was committed without his knowledge, then he shall be punished, so this is a rebuttable fact and burden lies upon the person, who states that the offence was committed without his knowledge. Its proviso also provides that where any offence under this Act has been committed by a company and it is proved that the offence has been committed with the consent or connivance of, or is attributable to, any neglect on the part of, any director, manager, secretary or other officer of the company, such director, manager, secretary or other officer shall also be deemed to be guilty of that offence and shall be liable to be proceeded against and punished accordingly. 14. In present case, bare perusal of para no.6 of complaint it is evident that there is specific mention that accused Nos.2-4 are directors of company and are in control of affairs of said company. The defence taken that they were not directors at the time of offence, is a fact which they have to prove before court below. The law cited above is not applicable, because in that case there was specific proof of resignation of Director as per Form 32 sent to Registrar of Companies. But in present case, there are only self written letter by petitioners which were sent to boards of directors of firm, without any Form 32 of Company Act. So these simple letters are not admissible. 15. Next argument of counsel for petitioners is that cheques in questions were issued, when there was no liability and were issued during purchase order. Further it has been argued that cheques were issued as security and have been misused. He has relied upon Annexure-E i.e. agreement/minutes of meeting allegedly executed between parties, wherein it is held that all the old security cheques, which have already been held with complainant shall be deemed invalid. Whereas counsel for complainant has rebutted this argument and has said that these are facts which are to be proved by petitioners before court below. 16. I have considered this aspect of the matter also. First from the perusal of Annexure-E, it is evident that this agreement was subject to conditions that all previous liability has to be cleared; which as per counsel for complainant has not been cleared. 139. Presumption in favour of holder.—It shall be presumed, unless the contrary is proved, that the holder of a cheque received the cheque of the nature referred to in section 138 for the discharge, in whole or in part, of any debt or other liability. 19. In present case, petitioner no.2 has admitted his signatures on cheques in question, so facts relied that there was no liability and cheques were issued during purchase order; that cheques were given as security and have been misused, are rebuttable facts to the facts narrated in complaint, which petitioners required to prove before court below. ―10. Having heard the learned counsel for the parties, we are of the view that the accused (Respondent 1) challenged the proceedings of criminal complaint cases before the High Court, taking factual defences. Whether the cheques were given as security or not, or whether there was outstanding liability or not is a question of fact which could have been determined only by the trial court after recording evidence of the parties. In our opinion, the High Court should not have expressed its view on the disputed questions of fact in a petition under Section 482 of the Code of Criminal Procedure, to come to a conclusion that the offence is not made out. The High Court has erred in law in going into the factual aspects of the matter which were not admitted between the parties. The High Court further erred in observing that Section 138(b) of the NI Act stood uncomplied with, even though Respondent 1 (accused) had admitted that he replied to the notice issued by the complainant. Also, the fact, as to whether the signatory of demand notice was authorised by the complainant company or not, could not have been examined by the High Court in its jurisdiction under Section 482 of the Code of Criminal Procedure when such plea was controverted by the complainant before it. ----------------- --------------- As is clear from the above observations of this Court, it is well settled that while dealing with a quashing petition, the Court has ordinarily to proceed on the basis of averments in the complaint. The defence of the accused cannot be considered at this stage. The court considering the prayer for quashing does not adjudicate upon a disputed question of fact. In Rangappa versus Sri Mohan, this Court held that once issuance of a cheque and signature thereon are admitted, presumption of a legally enforceable debt in favour of the holder of the cheque arises. It is for the accused to rebut the said presumption, though accused need not adduce his own evidence and can rely upon the material submitted by the complainant. However, mere statement of the accused may not be sufficient to rebut the said presumption. A post dated cheque is a well recognized mode of payment. Thus, the question has to be answered in favour of the respondent and against the appellant. Dishonour of cheque in the present case being for discharge of existing liability is covered by Section 138 of the Act, as rightly held by the High Court. Accordingly, we do not find any merit in this appeal and the same is dismissed. Since we have only gone into the question whether on admitted facts, case for quashing has not been made out, the appellant will be at liberty to contest the matter in trial court in accordance with law." 21. In view of above law, the defence taken by petitioners is not tenable in these petitions. Further, all the documents relied by petitioners were never before the trial court at the time of taking cognizance. So these cannot be relied in these petitions for quashing/setting aside the cognizance, unless these are public documents. 22. In view of above, these revision petitions are dismissed. Stay, if any, is vacated.